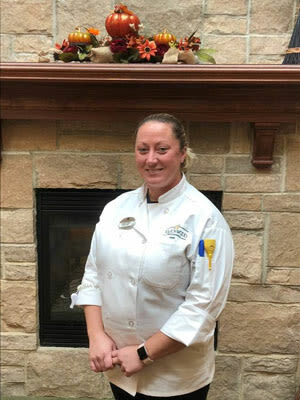 At Waltonwood, our pastry chefs make Halloween, Thanksgiving, and all of December extra sweet for residents. 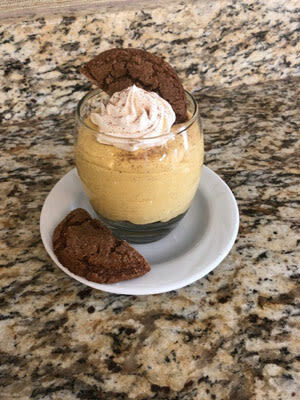 Waltonwood Providence Pastry Chef Kim Rappa’s signature Sugar-Free Pumpkin Pie, Pumpkin Cheesecake Mousse, and Pumpkin Blondies are the perfect addition to the season. 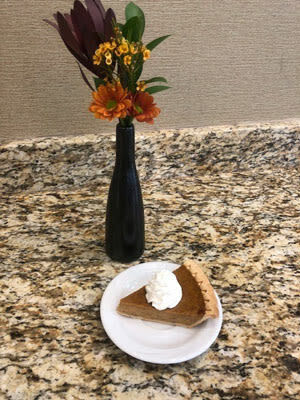 In honor of National Pumpkin Day, let us tempt your taste buds with her recipes. 1. Preheat oven to 400 degrees F. Position oven rack in the center of your oven. 3. In a large bowl, combine sugar, salt, cinnamon, ginger, and cloves; blend in beaten eggs at low speed of your mixer. Add pumpkin and evaporated milk; blend at high speed of your mixer until smooth. 4. Pour pumpkin mixture into the pastry-line pie plate. NOTE: To prevent spills, place pie plate on a wire rack or on the open oven door when filling with pumpkin mixture. 5. Bake 10 minutes; reduce oven temperature to 300 degrees and bake approximately 20 to 35 minutes longer or until the temperature registers approximately 175 degrees on a cooking thermometer. 6. Remember that the pie continues to cook after it is removed from the oven. Do not over bake! The center of the pie should be set but still wobbly; residual heat will finish the job. 7. Remove from oven and let cool on a wire cooling rack before cutting and serving. If desired, serve with sweetened whipped cream. 1. 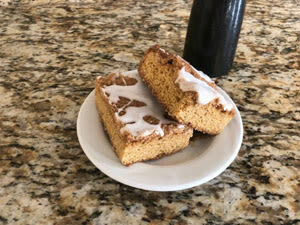 Whip the cream cheese, pumpkin and sugar together. Beat on medium speed for 3 - 4 minutes. Sugar should be dissolved. 2. Add the vanilla, cinnamon, ginger, and nutmeg. Blend thoroughly. 3. Fold in 1 cup of the whipped topping. When mixed in, fold in remaining whipped topping. Refrigerate. 4. When ready to serve, put in serving dish and top with additional whipped topping. Sprinkle with cinnamon sugar if desired. 1. Preheat oven to 350 degrees. Prepare a baking sheet with parchment paper, Silpat, or by greasing it. 2. In the bowl of an electric mixer with the paddle attachment, cream butter and sugar together on medium speed. Add egg and molasses and mix. 3. In a separate bowl, mix flour, salt, baking soda, cinnamon, cloves, and ginger together. 4. Gradually add the dry ingredients to the mixing bowl on low speed until everything is incorporated and a dough forms. 5. Scoop dough into balls. (Tip: Use a scoop that measures about 1 1/2 tablespoons.) Roll the dough ball in the sugar and place on the baking sheet (12 per sheet). There is no need to flatten the dough balls. They will spread out as they bake. 6. Bake for 11-13 minutes. Allow them to cool on a cookie sheet for a few minutes, and then transfer to a cooling rack to cool completely. Store in an airtight container. 1. Preheat oven to 350 degrees. Line a 9 x 13-inch baking pan with parchment paper and spray with baking spray. Set aside. 2. In the bowl of a stand mixer, affixed with the paddle attachment, add the butter and beat on medium-high speed until light and creamy. Add the brown sugar and molasses to the butter and beat until light and fluffy. Scrape down the sides of the bowl as needed. Add the eggs to the mixture one at a time, beating the first egg in completely before adding the second egg. 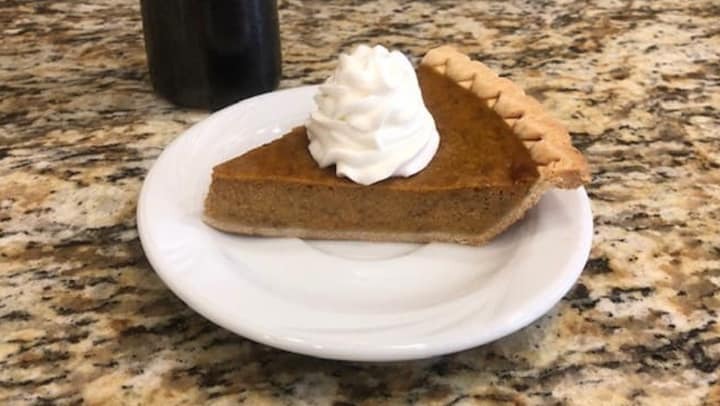 Add the vanilla extract, pumpkin spice extract, pumpkin pie spice and salt to the mixture, and mix on medium-high speed until fully incorporated. 3. Change the mixer speed to low and add the flour and baking powder to the mixture. Mix until barely incorporated. Remove the bowl from the mixer and use a rubber scraper to ensure all ingredients are incorporated. The batter will be thick. Dump batter into prepared pan and spread evenly into the pan. Put a little water on your fingers to help evenly spread the batter into the pan. Set aside. 4. Prepare pumpkin spice sugar mixture: In a small bowl, combine the sugar and pumpkin pie spice and stir until combined. Pour sugar mixture evenly onto the top of you blondie batter. 5. Bake blondies in 350-degree oven for 25 minutes. Remove the blondies from the oven and let set and cool completely before slicing into squares.